Transform complex data into profitable information. Business data discovery was never this easy – available as a service on the cloud! Get your data, use one of our pre-built application and begin your insightful data discovery. All this at one low monthly price with no contracts to sign! We at EzDataMunch figured out that users want to drive insights into the data in real-time without wasting time so we created a whole new way of analyzing your data instantaneously. Query all your data easily without writing a single code and answer all your questions anytime, anywhere on the go! All the classics charts and graphs plus maps, relational analysis, funnels and hundreds of customization points. Simply beautiful. Build a dashboard with a mouse and a couple clicks. Share it instantly with the world and let your users drill down, drill through and filter the data. User can slice and dice information with ease and discover insights that are not easy to find through traditional BI products. EzDataMunch helps users to collaborate and view insights on any device. With BOYD policies being accepted by many organizations, having a solution that can work on any device, any time, anywhere gives your users an edge every second of the day and be agile to take decisions! The heart of EzDataMunch is a very fast, in-memory engine of QlikView. QlikView provides immense flexibility to business users and provides lightning fast analytics using multiple data sources! We are in love with Google Big Query and unstructured content. 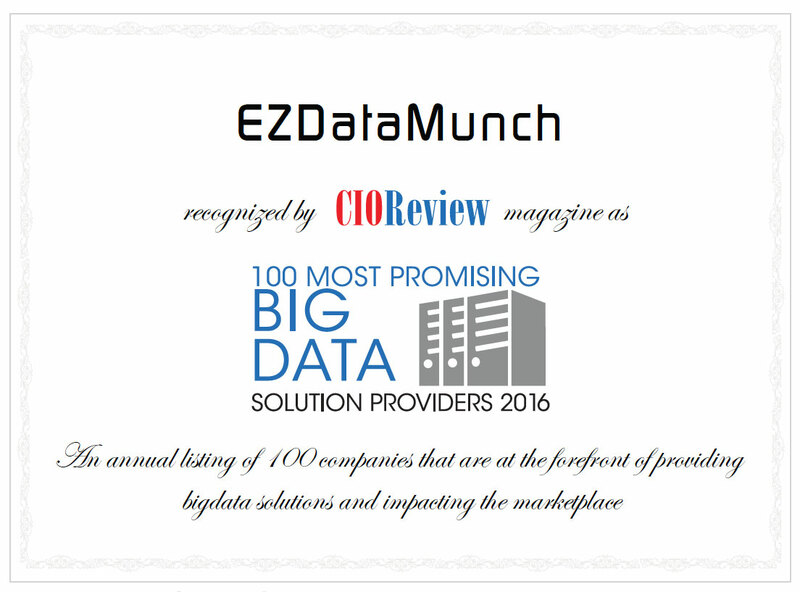 EzDataMunch platform is build to handle Big Data and provide the power of in-memory analytics that can help users to analyze such large data sets in a matter of seconds! EzDataMunch has many apps in its store with pre-built social media connectors for Facebook, Tweeter, Google Analytics, Blogs and internet data. No need to gather all your data in a single place for analysis across sources. The Document Centre is a feature that allows you to mix data very simply and display results on the same dashboard with a click of a button. EzDataMumch business intelligence (BI) products provide instant analysis that any user can share by just sending a link to another user. The Apps allow a dynamic meeting collaboration feature without using any other meeting application such as GotoMeeting, Webex, etc.